For the second year, Uptown Marion Main Street, the City of Marion, and Marion Chamber of Commerce invite residents to recognize and honor those who are serving or have served in the United States Armed Forces through sponsorship of streetlight banners in the community. The program was recently recognized as 2018’s Best Beautification Project in the state at the Main Street Iowa Awards. Main Street Iowa hosted the 33rd annual Main Street Iowa Awards celebration on Friday, March 8, 2019 at Scottish Rite Consistory in Des Moines. The program honored the efforts of those who work day-in and day-out to revitalize Iowa’s downtowns – the heart and soul of communities across the state. The awards honor outstanding accomplishments, activities and people making a difference in the state’s 53 Main Street districts. This year, 19 projects were selected to be recognized from the 129 competitive nominations submitted. 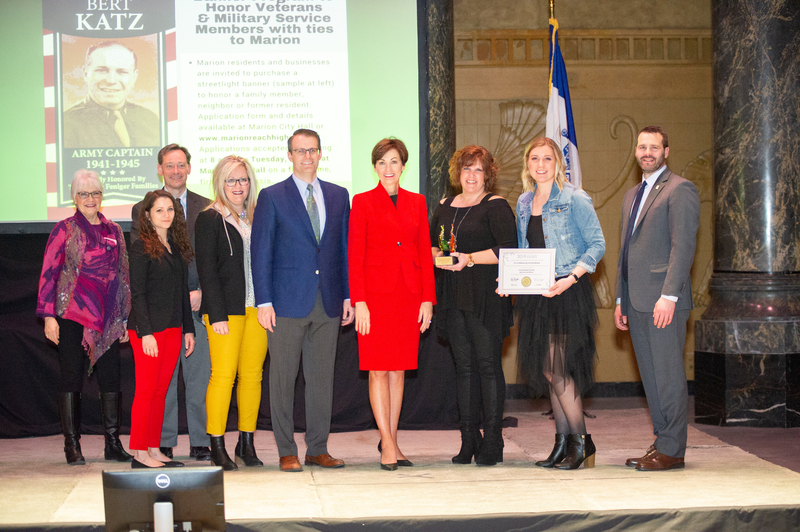 The honors were presented by Governor Kim Reynolds, Iowa Economic Development Authority (IEDA) Director Debi Durham and James Engle, director of IEDA’s Downtown Resource Center. “Main Street Iowa has stood the test of time since its introduction in 1985,” said Durham. “We continue to see significant growth in the amount of business, jobs and investment in communities of all sizes due to the program, and as a result, these districts serve as inspiring examples of what’s possible for Iowa’s downtowns. The Main Street Approach works, and Main Street Iowa has been a national model because we are creative, we embrace change and we demand local initiative and action,” Durham said. $20 million-dollar benchmark community award for realizing 20 Million Dollars in private investment into the district through renovations, new construction, and acquisitions. Uptown Leadership Award to Scott Swenson of the SBDC for his work in helping Uptown small businesses start and grow. Best Beautification Award for the Uptown Veteran Banner Program. Uptown Received the 2017 MSI Best Beautification Award for the Uptown Artway. Complete details and the application form are now available online at www.marionreachhigher.org or from any of the participating organizations.